A 36-year-old Blaine County man has been charged with two counts of burglary, a felony, for allegedly breaking into homes last week in the Deer Creek Road area north of Hailey. Donald Wise, who was living in the area, was arrested by Blaine County sheriff’s deputies on Tuesday, Oct. 21, when a Deer Creek Road resident allegedly caught Wise in his home and held him there until police arrived. “The homeowner came in and found an intruder in the house,” Sheriff Gene Ramsey said Monday. “The homeowner ordered him to get on the floor and when he wouldn’t he hit him with a stick. Ramsey said the incident occurred shortly after noon on Oct. 21. Wise has also been charged with burglary at another home in the area on Oct. 20 and is being investigated for at least one other break-in. He was formally charged with two counts of burglary and a misdemeanor count of petit theft at an initial appearance on Oct. 22 in Blaine County Magistrate Court. According to court records, Wise pleaded not guilty. Judge R. Ted Israel scheduled a preliminary hearing for 9 a.m. on Nov. 5. 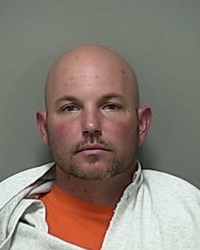 Wise remained incarcerated Tuesday in the Blaine County jail on $15,000 bond.